ABSTRACTDental amalgam material has been controversial for years because of the health hazards of mercury. Therefore, it is necessary to review the safety and performance of dental amalgam as a restorative material and its potentially harmful effects to patients and the dental care personnel. Various claims have been made about systemic conditions, particularly neurologic and psychologic effects, with amalgam as the suspected causal agent. However, the scientific evidence for risks of adverse systemic effects is inconclusive and the current use of dental amalgam does not pose a risk of systemic disease. As dentistry evolves, various attempts have been made to improve the profession, with the challenge of providing quality and affordable healthcare. Mercury is an element that has been used in the healthcare sectors for centuries in different forms. Dental amalgam, widely used for restorations, is one form. Much controversy surrounds the safety of dental amalgam as a restorative material. In developing nations such as India, dental amalgam is an important restorative material in the dentist’s armory. It is inexpensive for patients and user friendly for dentists working in peripheral setups. Eliminating or banning the use of dental amalgam may be a significant financial burden for many patients seeking restorative care. Therefore, amidst the hue and cry for or against the use of dental amalgam, uniform agreement and specified guidelines are needed . This article reviews several contradictory studies regarding dental amalgam. Mercury toxicity occurs through either elemental, inorganic, and organic forms, which vary in absorption and excretion rates. The chemical form determines the toxicologic profile: these are classified in order of toxicity:9 1) methyl and ethyl mercury compounds (organomercury); 2) mercury vapors (elemental mercury); and 3) inorganic salts and additional organic forms. However, because of improvements in amalgam capsule design, better awareness and practice of appropriate mercury hygiene measures, and growing use of alternative, nonmercury-containing materials, mercury exposure levels among dental professionals have been steadily decreasing. For the past few years, India has produced the most dental surgeons (78,096); and currently there are 291 dental colleges established in the nation. However, awareness of the adverse health effects of dental amalgam is lacking among dental surgeons and assistants. Therefore, educating dentists, dental students, and assistants about the hazards of inappropriate use of dental amalgam is essential. Proper training, adequate equipment, and sufficient resource allocation is necessary for safe dental mercury management. Therefore, regulating bodies such as the Dental Council of India and the Indian Dental Association should take steps to establish guidelines for mercury disposal, making it mandatory to register all the dental clinics and colleges, as well as hospitals, for a centralized amalgam waste collection system. The initial cost should be capped to elicit greater response from dental healthcare practices. Click here to view "Recommended Management of Dental Amalgam". Waste amalgam particles are created during the placement and removal of amalgam restorations, and some are found in the dental setup wastewater. Amalgam separators are one way of reducing the amount of amalgam that dental practices discard into sewers. 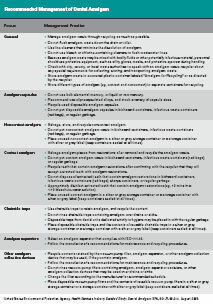 Amalgam separators use sedimentation, filtration, and centrifugation and ion exchange techniques. While there are various amalgam separators available, considering the economic factors that may be present in a typical office, this technology will be hard to implement universally. In April 2006, the Journal of the American Medical Association published two large clinical studies indicating that dental amalgam is a safe and effective cavity-filling material. The ADA Council of Scientific Affairs reviewed the literature on amalgam and concluded that amalgam is a “valuable, viable, and safe choice” for dental fillings.30 The US Food and Drug Administration issued a press release on July 21, 2009, stating that mercury-containing fillings are safe for use in dental treatment, thus changing an earlier caution against their use in certain patients. Dental amalgam remains an effective restorative material. From the multiple perspectives of performance and economics, it may be deemed the material of choice for some restorations in posterior teeth. However, the use of dental amalgam should be done with required precaution to minimize as much as possible the exposure to elemental mercury, which is suspected to be the main cause of amalgam toxicity for the patient and dentist. In India and other developing nations, uniformity is lacking for disposing the waste generated from discarded amalgam. In India, dentists should follow all possible precautions at their clinical setups to minimize the adverse effect of elemental mercury exposure as much as realizable. The overwhelming scientific evidence supports the usefulness of dental amalgam as a safe and effective restorative dental material. It remains an important and inexpensive option; however, dental healthcare workers must be aware that mercury should be handled cautiously. 1. Karliner J, Harvie J. The Global Movement for Mercury-Free Health Care. Health Care Without Harm; 2007. 2. Maxson P. Mercury Flows in Europe and the World: The Impact of Decommissioned Chlor-Alkali Plants. Brussels, Belgium: European Commission; February 2004. 3. World Health Organization. Mercury in Health Care Policy Paper. August 2005. 4. Pacyna JM, Pacyna EG, Steenhuisen FB, et al. Mapping 1995 global anthropogenic emissions of mercury Atmospheric Environment. 2003;37:109-117. 5. Third National Health and Nutrition Examination Survey. Centers for Disease Control Web site. http://www.cdc.gov/nchs/products/elec_prods/subject/nhanes3.htm. Accessed June 8, 2010. 6. World Health Organization Web site. Concise International Chemical Assessment Document 50. Elemental Mercury and Inorganic Mercury Compounds: Human Health Aspects. http://www.inchem.org/documents/cicads/cicads/cicad50.htm. Accessed February 26, 2010. 7. Vimy MJ, Boyd ND, Hooper DE, et al. Glomerular filtration impairment by mercury released from dental “silver” fillings in sheep. The Physiologist. 1990;33:651. 8. Enwonwu CO. Potential health hazard of use of mercury in dentistry: critical review of the literature. Environ Res. 1987;42(1):257-274. 9. Berlin MH, Clarkson TW, Friberg LT, et al. Maximum allowable concentrations of mercury compounds: report of an international committee. Arch Environ Health. 1969; 19:891-905. 10. Hursh JB, Cherian MG, Clarkson TW, et al. Clearance of mercury (HG-197, HG-203) vapor inhaled by human subjects. Arch Environ Health. 1976;31(6):302-309. 11. Eley BM. The future of dental amalgam: a review of the literature. Part 3: mercury exposure from amalgam restorations in dental patients. Br Dent J. 1997;182(9):333-338. 12. Dodes JE. The amalgam controversy. An evidence-based analysis. J Am Dent Assoc. 2001;132(3):348-356. 13. Environmental Health Criteria 118, Inorganic Mercury. Geneva: World Health Organisation, International Programme on Chemical Safety; 1991. 14. Hörsted-Bindslev P. Amalgam toxicity–environmental and occupational hazards. J Dent. 2004;32(5):359-365. 15. Ritchie KA, Gilmour WH, Macdonald EB, et al. Health and neuropsychological functioning of dentists exposed to mercury. Occup Environ Med. 2002;59(5):287-293. 16. Engle JH, Ferracane JL, Wichmann J, Okabe T. Quantification of total mercury vapor released during dental procedures. Dent Materials. 1992;8:176-180. 17. Newman S. Mercury toxicity. In: Workshop on Biocompatibility of Metals in Dentistry, Chicago: July 11-13, 1984. Chicago: American Dental Association; 1984:96-98. 18. Gerstner HB, Huff JE. Clinical toxicology of mercury. J Toxicol Environ Health. 1977;2(3):491-526. 19. Kingman A, Albers JW, Arezzo JC, et al. Amalgam exposure and neurological function. Neurotoxicology. 2005; 26(2):241-255. 20. DeRouen TA, Martin MD, Leroux BG, et al. Neurobehavioral effects of dental amalgam in children: a randomized clinical trial. JAMA. 2006;295(15):1784-1792. 21. Bellinger DC, Trachtenberg F, Barregard L, et al. Neuropsychological and renal effects of dental amalgam in children: a randomized clinical trial. JAMA. 2006;295(15): 1775-1783. 22. Bellinger DC, Daniel D, Trachtenberg F, et al. Dental amalgam restorations and children’s neuropsychological function: the New England Children’s Amalgam Trial. Environ Health Perspect. 2007;115(3):440-446. 23. Bellinger DC, Trachtenberg F, Daniel D, et al. A dose-effect analysis of children’s exposure to dental amalgam and neuropsychological function: the New England Children’s Amalgam Trial. J Am Dent Assoc. 2007; 138(9):1210-1216. 24. Lauterbach M, Martins IP, Castro-Caldas A, et al. Neurological outcomes in children with and without amalgam-related mercury exposure: seven years of longitudinal observations in a randomized trial. J Am Dent Assoc. 2008;139(2):138-145. 25. Bellinger DC, Trachtenberg F, Zhang A, et al. Dental amalgam and psychosocial status: the New England Children’s Amalgam Trial. J Dent Res. 2008;87(5):470-474. 26. Luglie PF, Campus G, Chessa G, et al. Effect of amalgam fillings on the mercury concentration in human amniotic fluid. Arch Gynecol Obstet. 2005;271(2):138-142. 27. Hujoel PP, Lydon-Rochelle M, Bollen AM, et al. Mercury exposure from dental filling placement during pregnancy and low birth weight risk. Am J Epidemiol. 2005;161(8):734-740. 28. Lindbohm ML, Ylöstalo P, Sallmén M, et al. Occupational exposure in dentistry and miscarriage. Occup Environ Med. 2007;64(2):127-133. 29. Ritchie KA, Burke FJ, Gilmour WH, et al. Mercury vapour levels in dental practices and body mercury levels of dentists and controls. Br Dent J. 2004;197(10):625-632. 30. ADA Council on Scientific Affairs. Dental mercury hygiene recommendations. J Am Dent Assoc. 1999;130(7):11251126. Hari Parkash is Director-General, I.T.S. Centre for Dental Studies and Research, Ghaziabad, India. Utkal K Mohanty is Former Senior Lecturer, I.T.S. Centre for Dental Studies and Research, Ghaziabad, India. Anil Kohli is President, Dental Council of India, New Delhi, India. Sunil Chaudhary is Associate Professor, Department of Oral Medicine and Radiology, I.T.S Centre for Dental Studies and Research, Ghaziabad, India.